One question that I’ve been asked MANY times is how to deal with clutter. So many of you say that you have so much “stuff” that you can’t seem to part with, mostly because you have spent good money on it and feel guilty throwing it away. Let me give you all some advice. 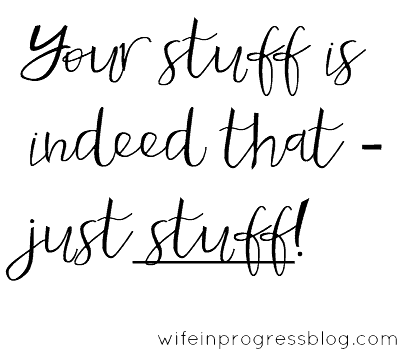 Your “stuff” is indeed just that – “stuff”. When we were preparing to sell our house we had to unload a lot of items. I really realized how many things we had accumulated over the 4 years that Brian and I had lived together. Saying this, decluttering really is a very emotional process. It’s not just about getting rid of stuff, it’s about making difficult decisions related to important things in our lives. If it were easy, you’d be done by now and you wouldn’t feel such angst over the whole process, right? BUT there is something strangely cathartic and freeing about getting rid of unused items. Don’t feel guilty about it. Sell them at a yard sale (the Facebook yard sale groups are awesome!) or donate them to charity. Your house will thank you and you will feel like a huge weight has been lifted. There’s really no secret to decluttering your home. 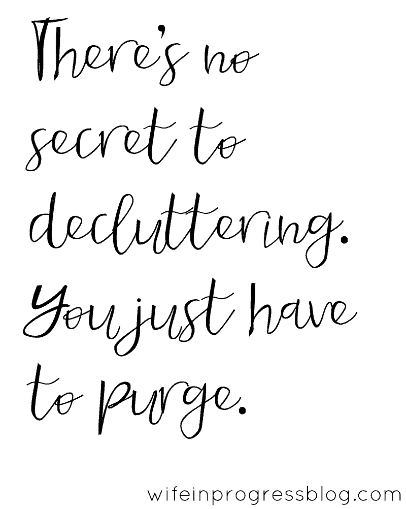 You just have to purge. Once you adapt the right mindset it is a game changer. However, getting to this frame of mind can of course be difficult. You just have to commit to letting things go. It’s really that simple. It must have a CURRENT purpose or be something you love. Marie Kondo, in the Life-Changing Magic of Tidying Up, tells us that everything you own has an intended purpose in your life. Once that purpose is fulfilled, you may not need that item any more. Just because an item was a gift does not mean you still have a purpose for it. If an item no longer has a purpose in your home, get rid of it! Don’t confuse organizing with decluttering. Your clutter can be organized but organization will be so much easier if you get rid of what you don’t need (i.e. declutter!). 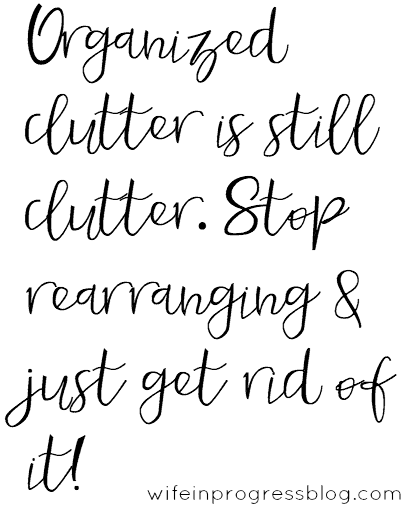 Otherwise, you’re just reorganizing and rearranging and not really changing your clutter situation. Finally, when you’re out and about and tempted to buy something. Stop and ask yourself – do I really love this? Do I really need this? Do I have a real need/purpose for this? If the answer is no, put it down and walk away! P.S. Are you really serious about decluttering and organization? Not just in terms of your physical “stuff” but paper clutter too? Then you’re going to love the Conquer Your Clutter Super Bundle. This exclusive bundle is offered at a 95% discount for 6 days only. Learn more about what’s included here. I’m so guilty of rearranging the clutter. Part of the problem is that much of our clutter is stuff we actually use, toys, or school papers. Somehow there’s got to be a way to organize all this stuff so that it’s out of sight but not out of mind! For the rest of it though, I’m definitely with you that stuff is just stuff! I think in terms of toys and papers it’s all about getting an organizational system in place. You know what they say – a place for everything and everything in its place! I like to be paperless as much as possible – so all receipts and other paperwork that need to be kept are digitized and stored in Evernote. Kid drawings are hung up or filed away if I REALLY want to keep them. School papers are also filed away or digitized. I’m all about labeling bins for toy storage…it’s amazing now that even my 2 year old (who obviously can’t read) knows where his toys go when he’s done playing. He’s getting to a point where he can help keep his playroom neat and tidy which is awesome! You should read this post – I just purchased the bundle that’s mentioned and it teaches you how to put systems in place for EVERYTHING. It’s really amazing value for what you’re getting!